Earlier drafts of the FNGOML distributed for comment in 2015 had generated a storm of negative criticism, especially in the West. But not just in the West, and not just to further the interest of Western states in the work of their public and private NGOs (For my commentary on the draft see Here and Here ; Here for the Commentary of Flora Sapio; and Here for Background Briefs; Here for discussion of regulatory architecture of NGOs in China). Chinese internal commentary was not uniformly positive (see, e.g., Jia Xijin, "Legislations for Foreign NGOs; how will the second boot land?" 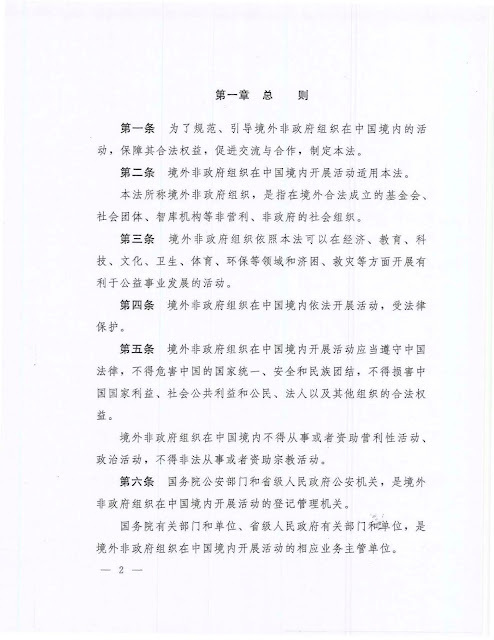 originally in Chinese in Caijing; English version here). This post introduces the final version of the FNGOML and some of the more interesting commentary. With this foundation, Flora Sapio and I offer additional commentary and thoughts on the ramifications and consequences of the decision to go forward with this version of a structure for the management of foreign NGOs and to place it within the wider context of the great challenge to states that globalization has produced in the for of an internationalizing civil society that exists increasingly beyond the control of territoriality confined states, and that which can operate within and beyond them (Managing Civil Society--Next Generation NGO Laws and Resistance to the Internationalization of Civil Society and its Normative Elements). Article 1. 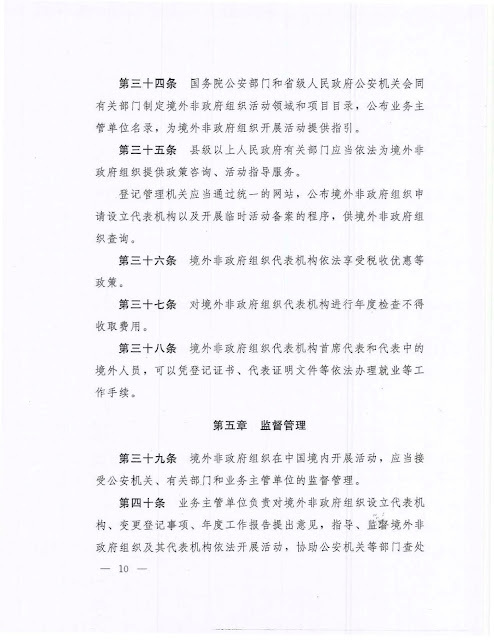 This law is designed to standardize and guide all activities carried out by overseas NGOs within China, and protect their rights and interests, while promoting communication and cooperation. Article 2. 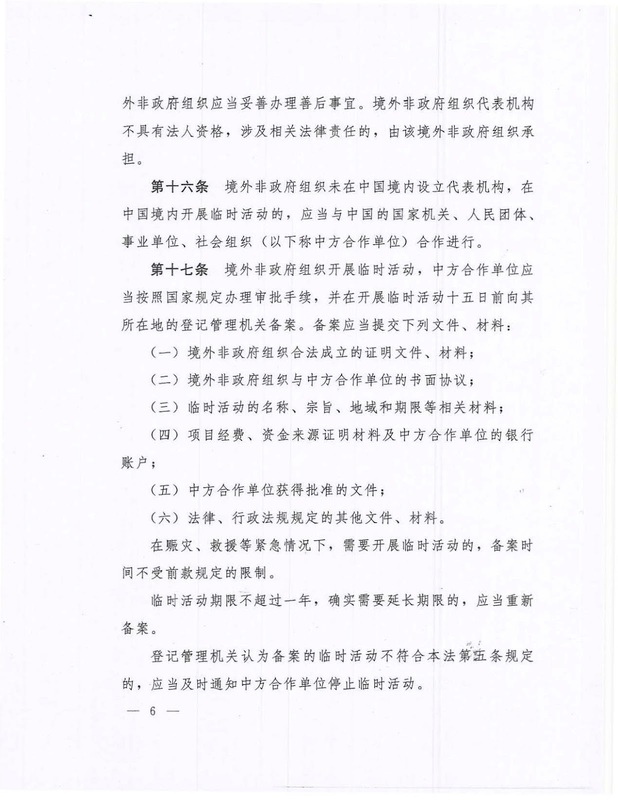 This law concerns overseas NGOs carrying out activities within China. 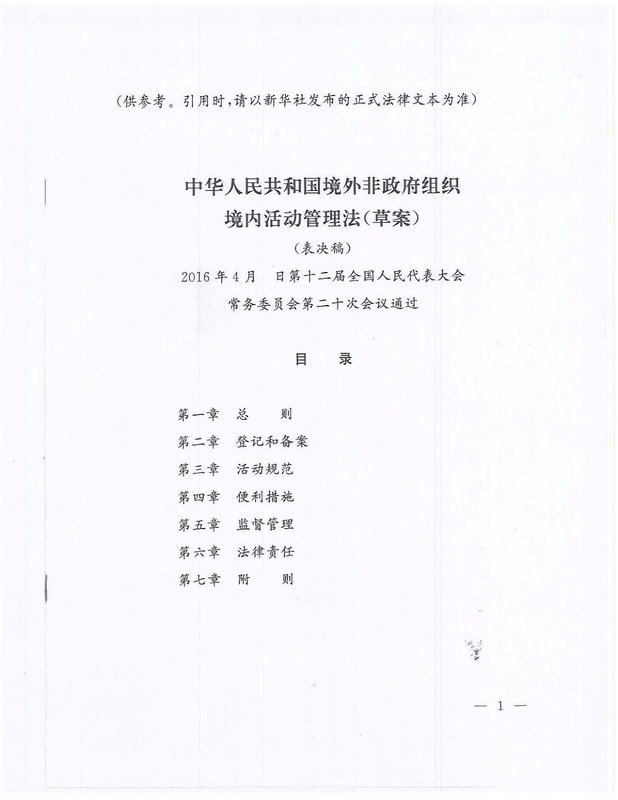 ‘Overseas NGOs’ refers to non-profit, non-governmental social organizations such as foundations, social groups and think tanks that have been lawfully established outside of mainland China. Article 3. Overseas NGOs that work in fields such as the economy, education, science and technology, culture, health, sports, environmental protection and in areas such as poverty alleviation and disaster relief may carry out activities that legally aid the development of public welfare in accordance with this law. Article 4. Overseas NGOs that conduct legal activities within China will receive the protection of the law. Article 5. 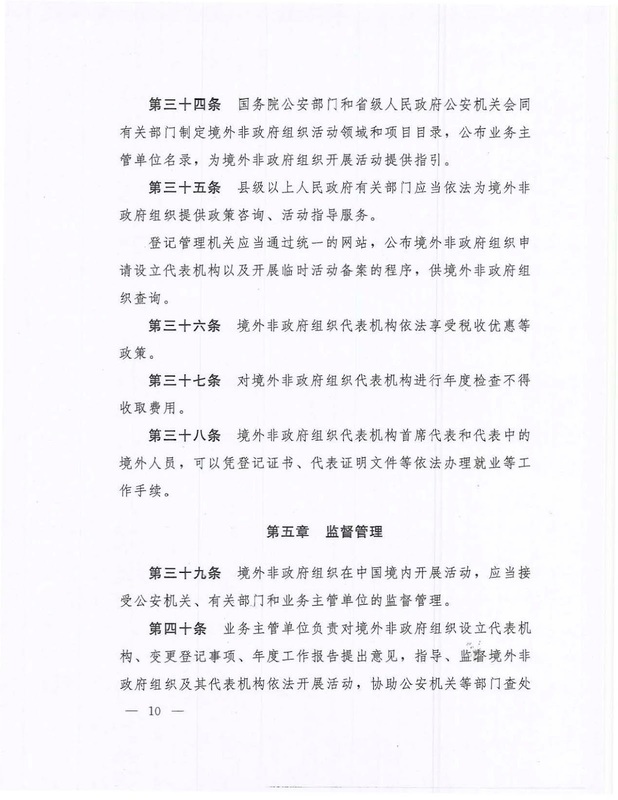 Overseas NGOs that conduct activities in China shall operate according to Chinese laws; not threaten China’s security or national and ethnic unity; and not harm China’s national interests, societal public interests, and the legal rights of citizens, legal persons and other groups. Furthermore overseas NGOs that conduct activities in mainland China must not engage in or fund for-profit activities or political activities. They must also not illegally conduct or fund religious activities. Article 6. The Public Security departments of the State Council and provincial level public security organs are in charge of the registration and management of overseas NGOs that conduct activities within China. The relevant departments and units of the State Council and provincial level governments are the Professional Supervisory Units (业务主管单位)for overseas NGOs conducting activities in mainland China. Article 8. The state will commend those overseas NGOs that provide outstanding contributions to the development of Chinese public welfare. Article 9. Overseas NGOs that conduct activities in China shall legally register and establish a representative office. Unregistered overseas NGOs that wish to conduct temporary activities in China shall legally file a record. It is prohibited for overseas NGOs that have not registered and established a representative office or filed for temporary activities to conduct or covertly conduct activities within China, or commission or covertly commission any domestic Chinese units or individuals to conduct activities within China. Article 10. 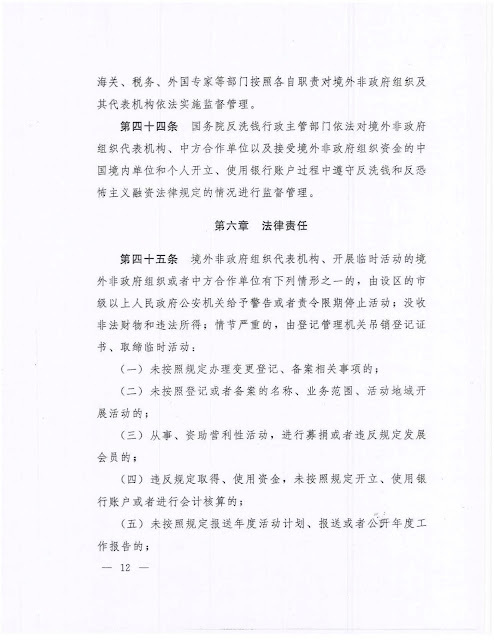 Overseas NGOs that meet the following requirements may apply to register and establish a representative office in China according to the scope of their work and the location and needs of their activities. (4) The NGO has been in existence for a continuous period of at least two years outside of mainland China and has conducted substantial activities during that time. (5) Conditions provided by other laws or regulations. Article 11. 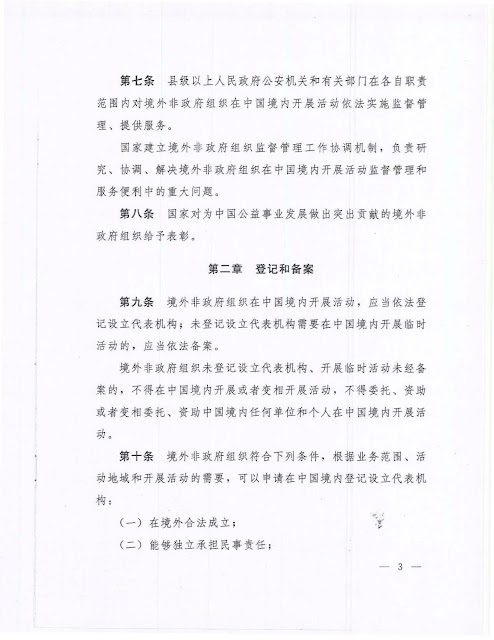 Overseas NGOs that apply to register and establish a representative office shall have received the consent of a Professional Supervisory Unit (业务主管单位). 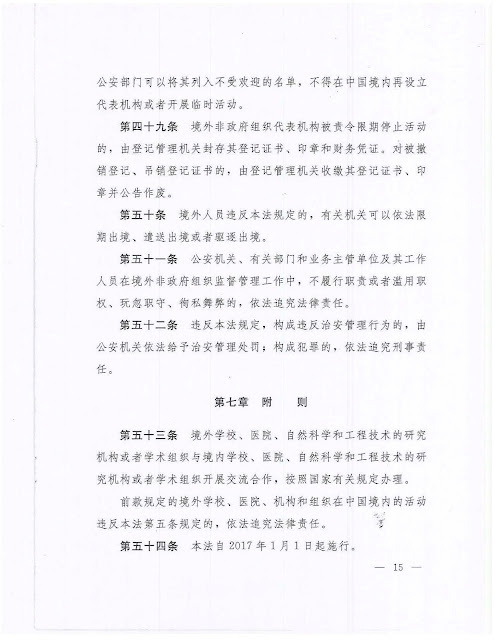 The list of Professional Supervisory Units will be published by the public security department of the State Council, the public security organs of provincial people’s governments and other relevant departments. (4) Documentation that states the address of the overseas NGO’s proposed representative office. (7) Any documentation and material required by other laws or regulations. The registration management authorities that review the application of overseas NGOs to establish a representative office in China may commission experts to conduct a review if this is deemed necessary. The registration management authorities shall issue a decision within 60 days of receiving an application. The representative office of an overseas NGO will use their registration certificate to register for taxes, get an official seal, and establish a bank account at a bank in mainland China. They shall file copies of the above documents with the registration management authorities. Article 14. When the representative office of an overseas NGO wishes to alter their registration information, they shall apply within 30 days of getting approval from their Professional Supervisory Unit. If an overseas NGO’s representative office has been deregistered, the overseas NGO that established the representative office shall deal with outstanding issues. As the overseas NGO’s representative office is not a legal person, the overseas NGO will bear any relevant legal responsibility. Article 16. 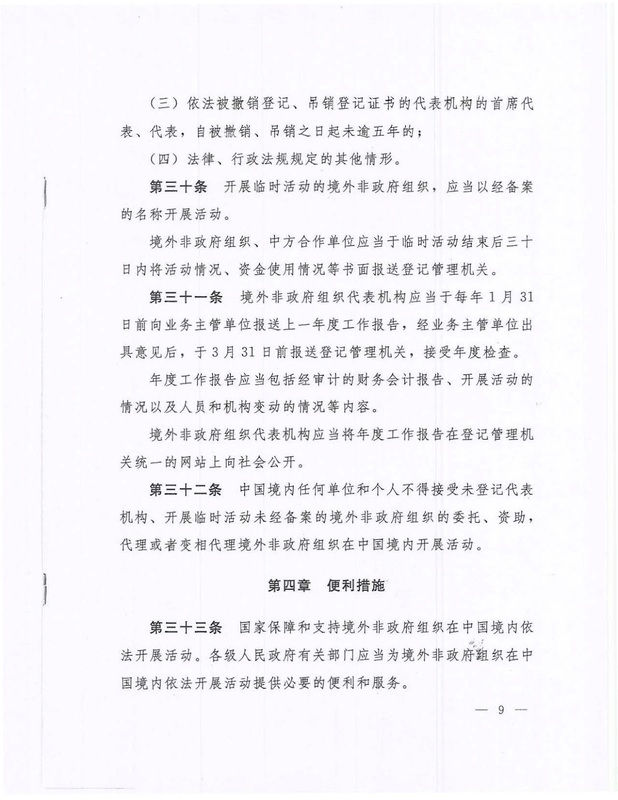 Overseas NGOs without a representative office in China that wish to carry out temporary activities in China shall cooperate with Chinese state authorities, mass organizations, public institutions, and social organizations (hereafter referred to as the Chinese partner organizations, or 中方合作单位). (6) Other documentation required by other laws or regulations. Where temporary activities are required due to emergencies such as disaster relief, the filing period is not limited by the previous article. The duration of the temporary activities shall not be more than one year. Where there is a genuine need for an extension, a new filing must be made. When finding that the temporary activity fails to conform with the requirement of article 5 of this law, the registration management authority must notify the Chinese partner organization to cease the activity. Article 18. If an overseas NGO has established a representative office within China, all of that NGO’s activities that take place within China should be managed by the representative office. The representative office of an overseas NGO shall carry out activities using their registered name, and within the operational boundaries that have been registered. 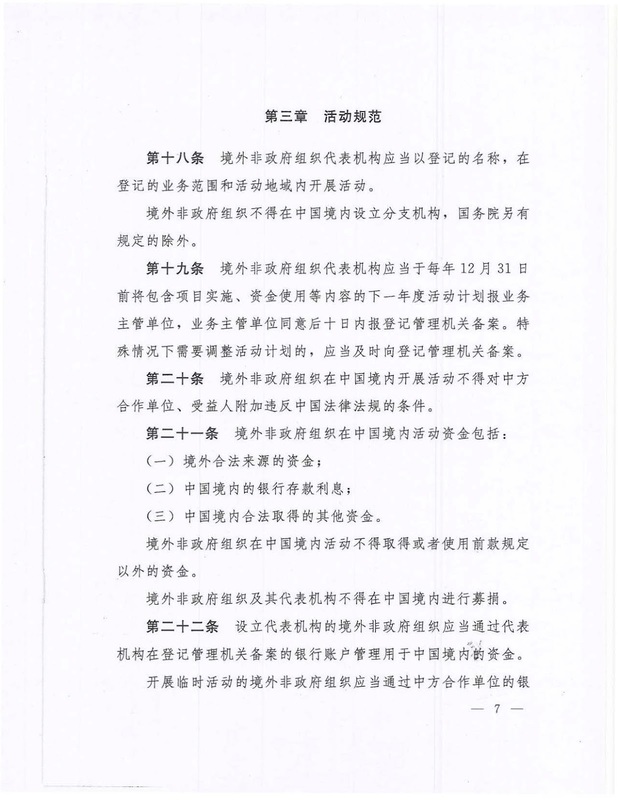 Unless otherwise regulated for by the State Council, overseas NGOs shall not establish any branch office in China. Article 19. The representative office of an overseas NGO shall submit an activity plan that details the projects that they intend to run and how they intend to use their funding in the coming year. This plan should be submitted to the Professional Supervisory Unit before December 30th every year. After it has been approved, the representative office shall submit it to the registration management authorities for filing within 10 days. Where there is a need to adjust the activity plan due to special circumstances, a filing should be made timely with the registration management authorities. Article 20. Overseas NGOs that run projects in China must not make additional conditions that require Chinese partner units or the project’s beneficiaries to break Chinese laws and regulations. (3) Other money that has been lawfully acquired within China. 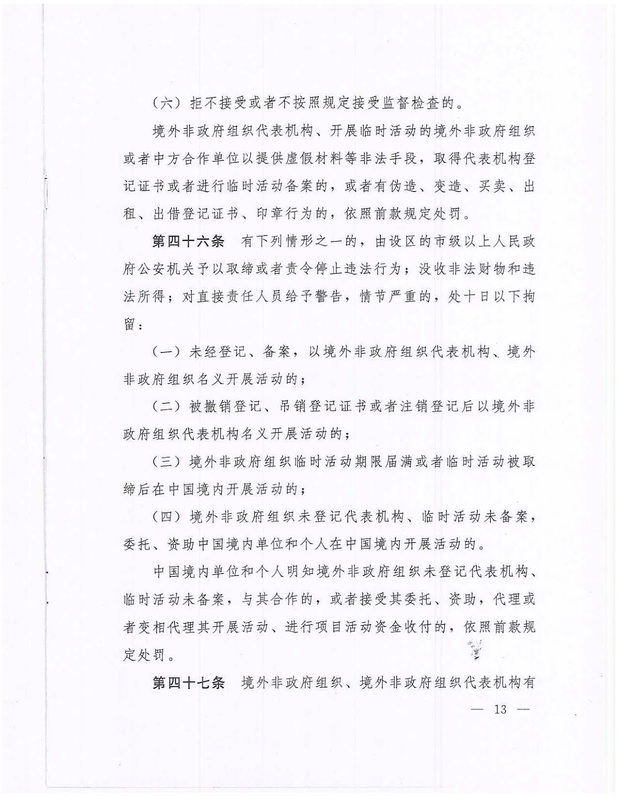 Overseas NGOs in China must not use funds that come from sources other than those described above for their activities in China. 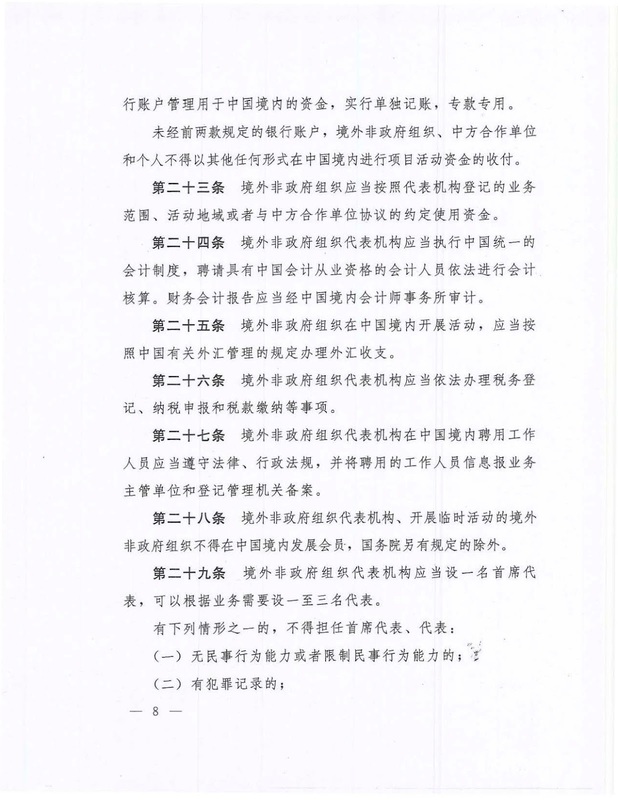 Overseas NGOs and their representative offices in China shall not conduct fundraising activities within China. Article 22. An overseas NGO that has established its representative office shall use the bank account that was filed with the registration management authorities to handle money within China. Overseas NGOs that run temporary activities in China shall use their Chinese partner organization’s bank account to handle funds in China. An independent account record should be kept, and the money used as agreed upon. Overseas NGOs, Chinese partner organizations and individuals must not use alternative methods to give or receive funds for project activities within China, other than those described above. Article 23. Overseas NGOs shall use funds according to the operational scope and location of activities that was approved when they registered their representative office, or as described in their agreement with their Chinese partner organization. Article 24. The representative office of an overseas NGO shall manage their finances according to standard Chinese accounting law and employ accountants that have been legally certified in China to manage its accounting. A Chinese accounting firm shall audit the financial records. Article 25. Overseas NGOs that run activities in China shall make bank transfers in accordance with China’s existing regulations that deal with foreign exchange. Article 26. The representative office of an overseas NGO shall legally make a tax registration and tax declarations, and pay taxes. Article 27. 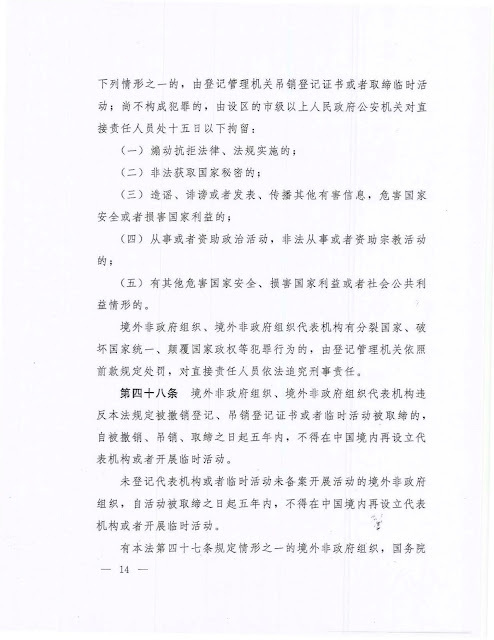 If the representative office of an overseas NGO wishes to recruit staff in China, they shall obey laws and administrative regulations and file information about their staff and personnel arrangements with their Professional Supervisory Unit and the registration management authorities. Article 28. 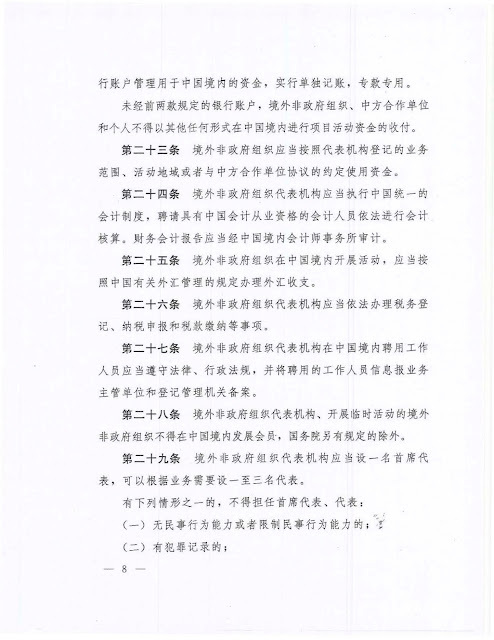 Representative offices of an overseas NGOs and overseas NGOs conducting temporary activities must not openly recruit members within China, unless otherwise regulated for by the State Council. Article 29. 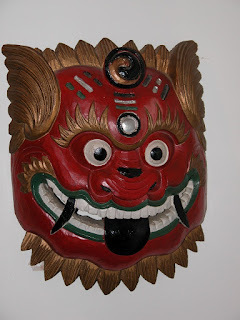 The representative office of an overseas NGO should have a chief representative. They can also recruit up to three other representatives if needed. (4) They fail to meet the conditions of other laws or regulations. Article 30. 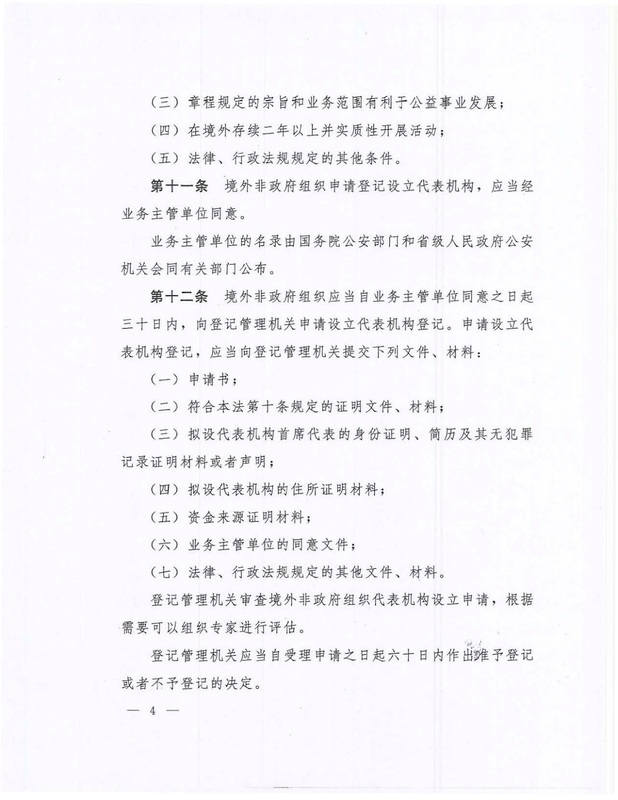 Overseas NGOs that conduct temporary activities in China shall do so using the name that was filed. Once a project has concluded, overseas NGOs and their Chinese partner organizations shall submit reports to the registration management authorities. The report shall include a description of the activity and its use of funds, and shall be submitted within 30 days of the cessation of the activity. Article 31. The representative office of an overseas NGO shall submit an annual work report to their Professional Supervisory Unit before January 31st. After the Professional Supervisory Unit has given its feedback, the report shall be sent to the registration management authorities by March 31st for annual inspection. The annual work report shall include an audited accounting report and descriptions of the activities and changes in staff or in the organizational structure. Article 32. Units or individuals in China shall not be hired by, accept financial support from, or represent or covertly represent overseas NGOs that have not legally registered a representative office or filed temporary activities within China. Article 33. The country safeguards and supports overseas NGOs to conduct lawful activities in China. Relevant departments at all levels of government shall enable overseas NGOs to carry out lawful activities and services within China. Article 34. The Public Security department of the State Council and provincial level public security organs, together with the relevant departments, shall stipulate areas of work and projects that overseas NGOs can work in, and publish a list of Professional Supervisory Units in order to guide the activities of the Overseas NGOs. Article 35. Relevant government departments at the county level and above shall provide policy advice and activities guidance to overseas NGOs in accordance with the law. The registration and management authorities shall set up unified websites to make public the process of overseas NGOs applying for representative offices or temporary work permits. Article 36. Overseas NGO representative offices shall enjoy tax benefits and other favorable policies in accordance with the law. Article 37. Fees cannot be charged for the annual inspection of overseas NGOs’ representative offices. Article 38. Overseas chief representatives and other expatriate representatives of an overseas NGO’s representative office, may use the organization’s registration certificate, documents proving the representative’s status, and other material to apply for work permits in accordance with the law. Article 39. Overseas NGOs conducting activities within China shall be supervised and managed by public security authorities, relevant departments, and Professional Supervisory Units. Article 40. Professional Supervisory Units shall provide advice to overseas NGOs on setting up a representative office, changing registration status, and annual work reports; they shall guide and oversee the activities of overseas NGOs and their representative offices according to the law; and assist public security authorities and other departments in investigating and punishing illegal activities by overseas NGOs and their representative offices. Article 41. Public security authorities are responsible for the registration of the representative offices of overseas NGOs, annual inspections and the filing of temporary activities by overseas NGOs; and for investigating and punishing illegal activities by overseas NGOs and their representative offices. (5) Close down or seize venues, equipment, or property related to activities suspected of breaking the law. Article 42. Public security authorities may access the bank accounts of organizations or individuals related to an investigation, and related financial institutions and financial supervision and management institutions shall cooperate. If the approval of a person in charge of a public security authority at the municipal level and above (under which administrative districts are established) is gained, bank accounts related to illegal activities may be frozen with permission from a court. 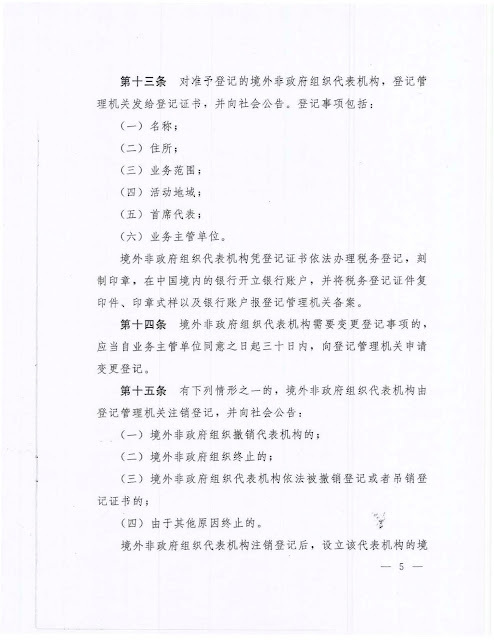 The bank accounts can also be frozen according to the Criminal Procedure Law of the People’s Republic of China, if they are related to suspected criminal activities. Article 43. Departments of national security, diplomatic and overseas affairs, fiscal and financial supervision and management, the customs, tax authorities, departments in charge of overseas experts and other relevant departments shall supervise and manage overseas NGOs and their representative offices according to the law and their respective responsibilities and areas of work. Article 44. The anti-money laundering departments under the State Council shall supervise and manage the opening and use of bank accounts by the representative offices of overseas NGOs and their Chinese partners, and also the opening and use of bank accounts by individuals and organizations within China receiving funding from overseas NGOs, for compliance with laws and regulations against money laundering and terrorism financing. Where the representative offices of overseas NGOs, overseas NGOs’ carrying out temporary activities, or their Chinese partners use illegal methods such as providing false information to obtain registration certificates for representative offices or to file for carrying out temporary activities; or where there are acts of counterfeiting, altering, buying and selling, renting or loaning registration certificates or seals, sanctions shall be given in accordance with the preceding provisions of this article. 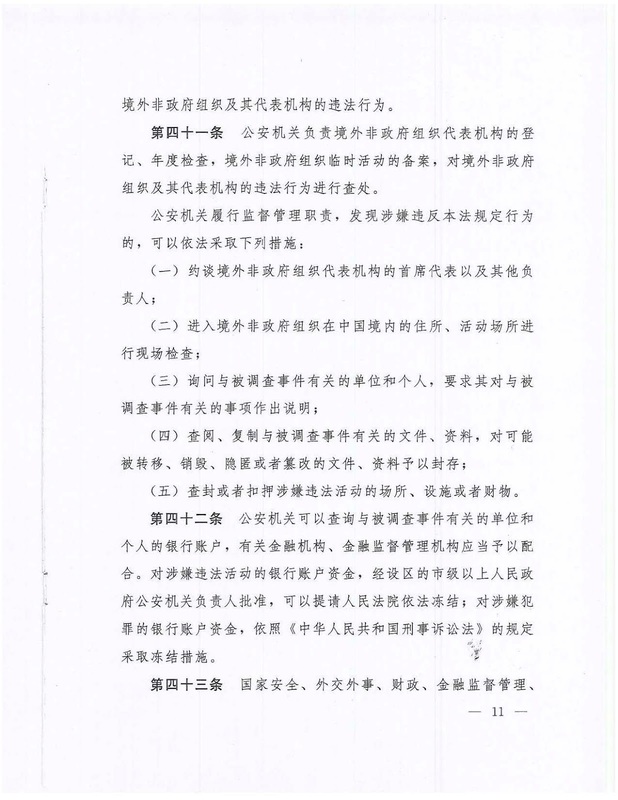 Where units and individuals within China work with overseas NGOs despite knowing that these overseas NGOs have not registered or filed their temporary activities; accept their authorizations or funds; work directly or indirectly as their agents; or help process program operation funds for them, sanctions shall be given according to the preceding provisions of this article. (5) Other activities that undermine state security and harm national interests or societal public interests. 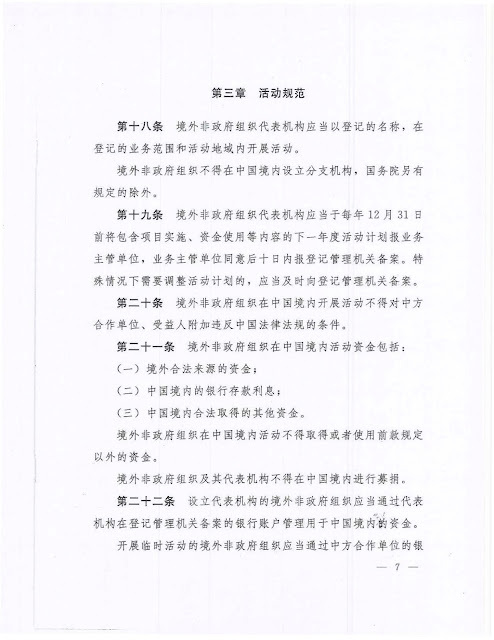 Where overseas NGOs or the representative offices of overseas NGOs engage in separatism, attempt to undermine national unity or subvert state power, or commit other such crimes, the registration and management authorities shall enact punishment in accordance with the preceding provisions of this article, and bring criminal charges against the persons directly responsible in accordance with law. Article 48. Overseas NGOs and the representative offices of overseas NGOs that are deregistered, have their registration certificates revoked or their temporary activities shut down must not again set up representative offices or carry out temporary activities within China within five years from the date of deregistration, revocation, or shutting down. Overseas NGOs that carry out activities without obtaining registration status or filing temporary activities must not again set up representative offices or carry out temporary activities within China within five years from the date of cancellation of their activities. 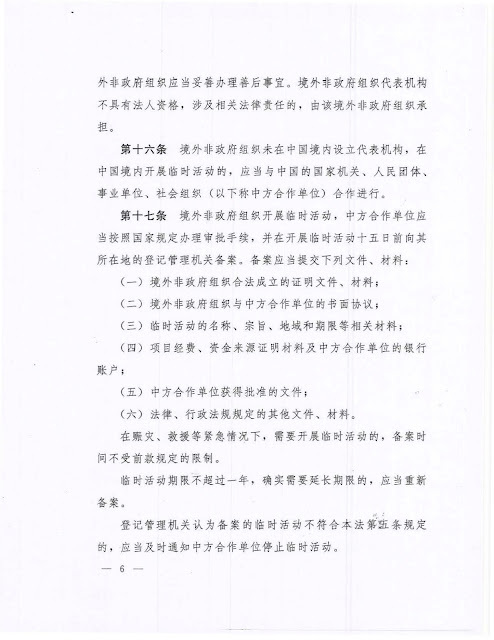 Overseas NGOs violating article 47 of this law may be added to a list of unwelcome NGOs by the public security department under the State Council, and must not again set up representative offices or carry out temporary activities within China. Article 49. Representative offices of overseas NGOs that are ordered to stop operations within a certain period of time shall have their registration certificates, official seals, and accounting documents sealed and stored by the registration and management authorities. For organizations that are deregistered or whose registration certificates have been revoked, the registration authorities shall confiscate and publicly announce the cancellation of their documents and official seals. Article 50. For foreigners violating this law, related departments may order their departure within a given period of time, have them repatriated, or deported. Article 51. 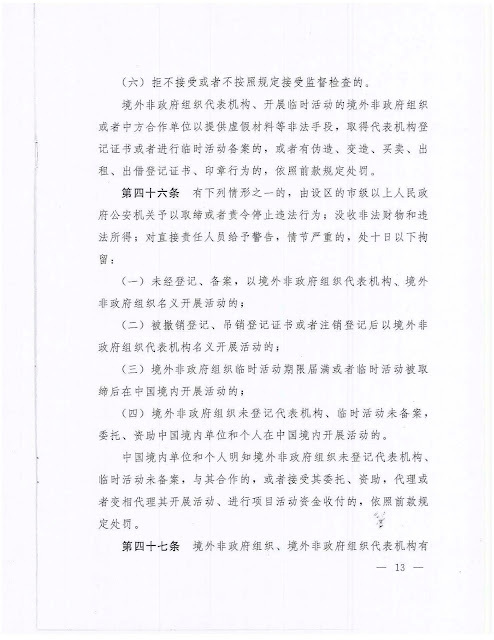 If public security authorities, related departments, professional supervisory units and their staff refuse to carry out their duty, abuse power, are negligent or corrupt in supervising and managing overseas NGOs, they shall be prosecuted for legal liability in according with the law. Article 52. Where violations of provisions of this law constitute a violation of public security administration regulations, the public security authorities shall give public security administrative sanctions in accordance with the law; where a crime is constituted, criminal charges shall be brought in accordance with the law. Article 53. Where overseas schools, hospitals, scientific and engineering technology research institutions or academic organizations engage in exchange and cooperation activities with schools, hospitals, scientific and engineering technology research institutions or academic organizations within China, relevant state regulations shall be applied in handling such activities. Where activities carried out by overseas schools, hospitals, institutions and organizations described in the preceding provision of this article violate Article 5 of this law, legal liability shall be pursued in accordance with law. Article 54. This law shall come into force on January 1, 2017.